We had our first doctor's appointment this week. 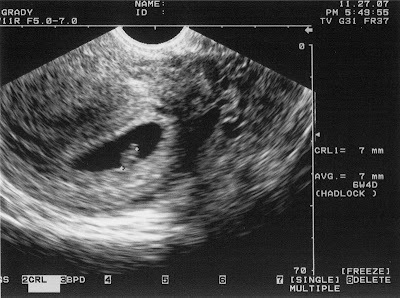 The fun part was seeing our little blueberry-sized baby on the ultrasound as part of the confirmation of the pregnancy. And as a bonus, we saw the heartbeat, which is always a good sign this early along. We brought home this picture and showed it to Dylan, who immediately sat down with it and wouldn't let it go. Being two means he doesn't understand the fullness of what is going on, but he does get excited when we talk about the baby in mommy's tummy. Of course, with all my friends with new babies recently (3 so far, with another one due in two weeks! ), he just might understand more than I realize. One thing is for certain, I'm glad Dylan is making progress with his potty-training. He's consistently been using his potty chair at least 2-3 times a day (still with cues from mommy and daddy, but we are very proud of the progress)! Who knows, maybe by the time baby #2 arrives, we'll be down to just one in diapers! I can hope now, can't I?